→Can My Dog Eat Potatoes? The cute little curious brown eyes, the pink hanging tongue, the mild woofs (barks) and the furry tail wags- make sense- It’s time for food. You can feed him yummy potatoes, but your dog may or may not digest the potato recipe. The answer is “ Yes. Dogs can eat potatoes, but the amount must be restricted.” Check below a few types of potatoes which dog's can or cannot eat. 1. Can dogs eat sweet potatoes? Yes, dogs can eat sweet potatoes. Apart from a good source of carbohydrates, sweet potatoes are loaded with vitamins and antioxidants. Your canine’s blood sugar level will remain stable as sweet potatoes have a low glycaemic index. On the negative side, lots of starch are present in sweet potatoes that can make your loyal friend obese. 2. Can dogs eat mashed potatoes? Yes, dogs can enjoy some mashed potatoes, but, strictly “UNSEASONED.” Never add sour cream, gravy, butter, onion powder, garlic, salt, etc. Let the magnesium, Vitamin B6 and C, and iron works for your dog’s health benefit. Butter and gravy can cause diarrhea in dogs. Garlic and onion are poison for them and induce anemia. If your dog consumes too much salt, he can become dehydrated fast. 3. 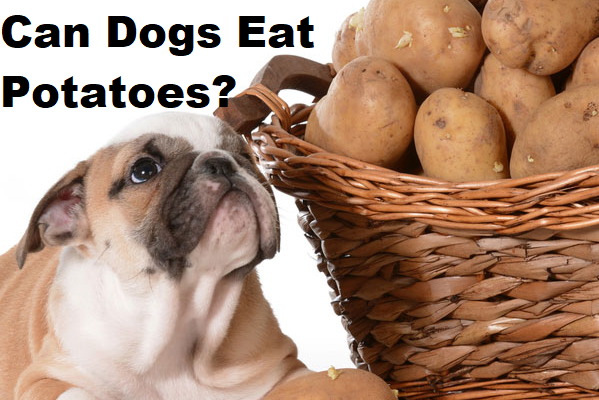 Can dogs eat raw potatoes? No, dogs cannot eat raw potatoes. Refrain from giving raw potatoes to the dogs. They find raw potatoes extremely hard to digest. Raw potatoes block their gastrointestinal tracts resulting in diarrhea, abdominal pain, and vomiting. Diabetic dogs should be kept away from raw potatoes; otherwise, it would raise their blood sugar level. 4. Can dogs eat potatoes skin? No, dogs can’t eat potatoes skin or potato with skin. Always remove the skin. A poison named solanine, present in the potatoes’ skin is dangerous for the esophagus and stomach lining of your canine buddy. Cooking won’t destroy all of it. 5. Can dogs eat potato chips? No, your dogs can’t eat potato chips at all. The salt, oil, spices, artificial flavors, sodium, etc. are not dog-friendly ingredients. After eating salt, dogs suffer from excessive thirst and urination that triggers sodium ion poisoning. Dog eating potato chips can experience depression, vomiting, tremors, seizures, high temperature, and diarrhea. 6. Can dogs eat baked potatoes? A moderate amount of baked potatoes are okay for your furry friend. But, it should be stringently without any addition of salt and spices. Too much of baked potatoes containing carbohydrates and starch will make them fat. 7. Can dogs eat cooked potatoes? Yes, dogs can eat cooked potatoes, but without skin. Don’t forget to peel the skin. Cooking the potatoes reduce the solanine level. Usually, a dog’s body derives most of the essential nutrients from the animal protein. A moderate amount of plain cooked potatoes without any addition is okay for them. 8. Can dogs eat red potatoes? Yes, dogs can consume subtle sweet red potatoes loaded with mild-medium sugar content. With a variety of minerals and vitamins A, C, K, folate, calcium, magnesium, potassium, Omega 3 and 6, red potatoes without any spices, oil and salt are the safe option for your potato-loving dogs. Even, the red skin is a superb source of dietary fiber for them. 9. Can dogs eat potato fries? “No,” don’t give your dog potato fries. Your cuddly buddy can love to munch the crispy French fries, but, the oil, butter, cheese, salt, and spices are extremely harmful to them. Excessive salt destroys their body’s electrolyte balance. The salt poisoning can cause kidney damage. 10. Can dogs eat boiled potatoes? Yes, you can give your dog a modest amount of boiled potatoes. Peel off the skin. Don’t add salt. Plain boiled potatoes are easy to chew and digest. 11. Can dogs eat white potatoes? Yes, dogs can eat white potatoes. They are economical and are quality grain-free food. If your little pooch is diabetic, refrain from adding white potatoes in his diet due to the vegetables’ higher glycemic index. Finally, potato, a vegetable of the nightshade (Solanaceae) family can be added to the dogs’ diet in moderate amount. Peeled, Boiled, baked, mashed and cooked potatoes without any oil, salt and spices are fine; whereas, raw, skinned, fried and processed potatoes are extremely dangerous for them.